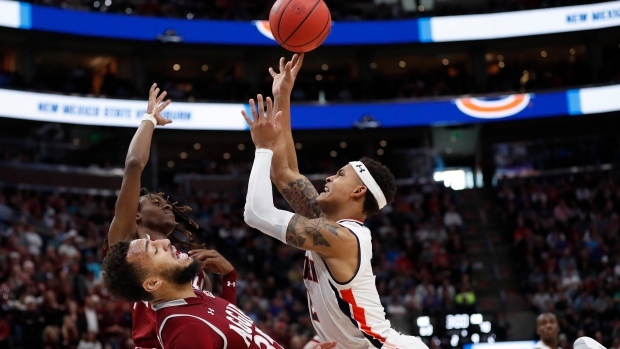 SALT LAKE CITY — After a teammate passed up an open layup that could have tied the game, New Mexico State's Terrell Brown was fouled behind the arc and missed two of three free throws as the Aggies dropped a 78-77 heartbreaker Thursday to fifth-seeded Auburn in the NCAA Tournament. Auburn had attempted 1,052 3-pointers this season -- third most in the country -- before the game and kept it going. All but two of Auburn's six field goals over the final 11 minutes were from 3, and one of those resulted in McCormick's three-point play. The Tigers went 12 for 31 from behind the arc. Jared Harpermade all four of his in the second half and led Auburn with 17 points.